Proocam Pro-F027 Filter Convertor Shackle (52mm) aids in holding coloured filters in position. It is made from CNC which is actually very good quality which making lens converter long-lasting. It also allows you to mount ND, UV lens, gradient filter lens or polarizing lens. The proocam Pro-F027 Filter Convertor Shackle (52mm) has a lot to offer, but one thing it lacks is a way to mount a filter. 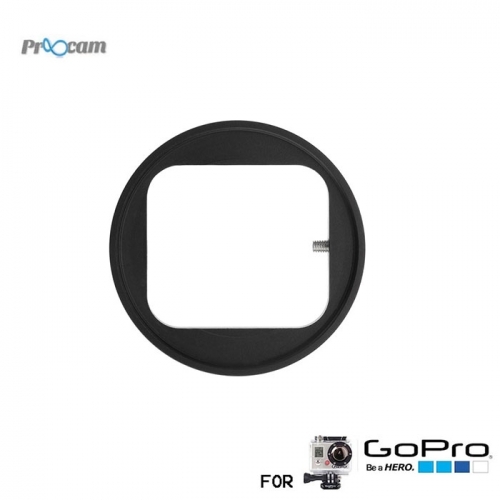 The Revo 52mm Filter Mount for GoPro HERO4 Standard Housing allows you to use standard 52mm filters over the lens port of the HERO4 Standard Housing. This can be useful if you want to use an ND for shooting at slower shutter speeds, if you want a polarizer for more vivid daylight imagery, or to use a color correction filter underwater. Constructed from die cast aluminum, the adapter is secured in place by a small Philips head screw.